If you did not have a chance to listen in to the Texas Conflict Coach last week, here is a quick overview of what you missed. You can download or stream the show by clicking on the Blog Talk Radio link at the bottom of the page. I came across the book “The Mediation Process: Practical Strategies for Resolving Conflict” by Christopher Moore, while I was earning my Masters in Conflict Analysis and Resolution at George Mason University. 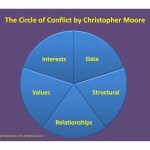 One of the key concepts within the book is the circle of conflict. Imagine a circle cut into five wedges. Each wedge represents potential causes of conflict. 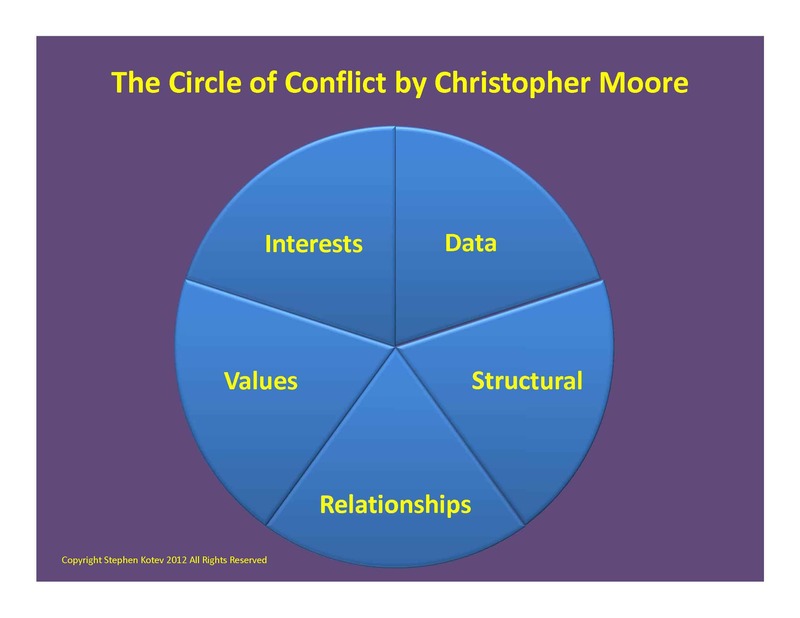 Data, structural, relationships, values and interests make up the five wedges of the circle. Each wedge can be the source of the problem or multiple wedges can be the cause of the problem. You can use this concept to help you figure out what is the origin of all of your headaches. Consider learning about this concept as adding another tool to your problem-solver tool kit. Let’s take the first wedge: data or information. One of the causes of your problem could be that you are either missing information or the information you have is flawed. Or you could have different views of what information is relevant. Sometimes it’s different interpretations of the data or different ways the data is assessed. The key point here is that data or information is the root of the problem. The next wedge is structural. To better understand this wedge, think of how larger systems can impact the problem. It’s not that different than the nested theory of conflict that we talked about on the show Got Conflict? Unraveling the Problem, where we looked at the macro and micro factors than can contribute to your problem. A difference in power or authority is a good example of a structural problem. Another example is who controls resources and how are those resources allocated or dispersed. Time constraints could be another cause of the conflict. This wedge is all about the systemic or structural factors that contribute to the problem. The third wedge of the circle is relationships. Misperceptions or stereotypes of others are common causes of relationship conflicts. Poor communication or miscommunication is often the instigator of many managers’ headaches. Finally, repetitive negative behavior by an employee or unit will force managers to intervene. The theme to this wedge is how folks relate to each other and does their behavior contribute to the problem? Values are the focus of the fourth wedge. Different ways of life, ideology or worldview are examples of how what you value can be part of the problem. Having different criteria for evaluating ideas is another example. This wedge is all about what folks value and if they are on the same page about those values. The final wedge is interests. Interests are the ‘why’ in any problem. Most people will tell you ‘what’ they want, which we call their position. Interests are why they want it. Interests are the motivation for the action. They are what is behind the position, that is, the real need or desire of the person. Examples here are perceived and or actual competition over interests. That is, are you both actually competing for the same thing or do you just think you are but deep down inside you really want something else? Or it could be an argument over what procedure to use to execute a task. Also, sometimes deeper psychological differences are the root cause of the problem. This final wedge asks us to look at the motivations of others to determine if this could be a root cause of the problem. In summary, we have five areas – data, structural, relationships, values and interests – that are potential root causes of your problem. By using the circle of conflict, you can begin to analyze the problem from a more objective viewpoint and untangle your problem with less effort and wasted energy. So when in doubt, consider the circle of conflict. which wedge is the most significant cause of conflict? Unfortunately, the answer is “it depends.” It depends on the situation. As social organisms, humans tend to have more relationship conflicts. That does not mean that the other wedges are not also factors. I think the best answer to your question would be “all of the above.” Meaning that all of the wedges are the most significant causes of the conflict. The basic idea there is that reality has multiple dimensions which cannot be collapsed into eachother. Rather, each dimension has its own truth. So, just as you are saying here, a conflict can (and probably does) appear in multiple ways. You might solve one aspect (e.g., align interests) without solving others (e.g., the structural issues). I think this broader view is important to fully understand what is actually happening in a conflict. One from the main reasons teams fail is because the people on the team don’t like the other person. It means either of you happen to be holding back how you feel. This can help in managing diverse employees and looking after their team spirit and camaraderie with each other. Absolutely! More often the team members won’t know how to constructively present feedback so animosity builds as the behavior persists. Effective engagement is the key to conflict competency and high-performing teams.